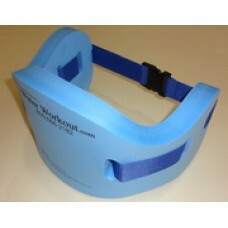 The WaterWorkout Flotation Belt provides support for the lower back during deep-water aerobic exercises. Exercising with the flotation belt increases arm strength and tones the abdominal muscles while reducing shoulder stress. Burn fat, tone your muscles and have fun with the WaterWorkout Flotation Belt. Resilient closed cell foam dries quickly, won't absorb water, and resists chlorine damage. Contoured design supports and strengthens the lower back. Adjustable waist band features a quick-release, easy to operate buckle. The belt can be worn upside down or with the foam in front of the body to meet the needs of all body shapes.